Preheat the oven to 200˚C, gas mark 6 and liberally butter a baking sheet. If you are using homemade puff pastry, roll out to a thickness of 2mm. Alternatively, spread out the ready-rolled pastry. Using a ruler, cut the pastry into 6 rectangles, each about 18cm x 7cm. Lay these on the baking sheet. Mix the caster sugar and ground cloves in a small bowl. Pour the lemon juice into a larger bowl. Sit the first apple on its calyx and slice finely from top to bottom until you reach the core. Toss the slices in the lemon juice. Repeat the process on the other side of the stalk. Toss the slices in the lemon juice. Cut off the remaining two quarters from the core and finely slice into half-moons. Repeat the process with the remaining apples. 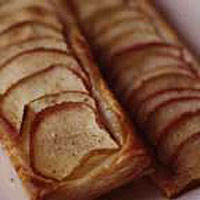 Neatly overlap the round apple slices along 3 or 4 of the pastry rectangles. Repeat the process with the half-moon apple slices on the remaining pastry slices. Sprinkle the clove sugar evenly over the apple and immediately place in the oven. Bake for 15-20 minutes or until the pastry is golden brown and the apples lightly cooked. Serve warm with clotted cream.